The Husqvarna 353 chain saw is a professional saw with high capacity across a wide rpm range. The E-TECH® series engines help to reduce exhaust emissions, whilst it's high-power, low weight, slim body and high centre of gravity make it both powerful and easy to use. This is an extremely popular model receiving numerous positive reviews. Many operators enjoy the wide power band that makes this saw so exceptionally versatile, and the Smart Start® fuel pump system for easy starting. It incorporates a number of interesting features, including a centrifugal air cleaning system that removes larger dust and debris particles before reaching the air filter. This results in reduced air filter cleanings and an improved engine life. The ergonomic design makes it very easy to use, allowing the user to work far longer with less fatigue. It also has a LowVib® system that has been designed to reduce vibration levels to the operator, which also helps to lessen fatigue. Users will also appreciate the combined choke/stop control which allows for easier starting, and reduces the risk of engine flooding. whilst the side-mounted chain tensioner permits easy access to the chain tensioning device. Additionally there is a snap lock cylinder cover, a real time saver when it comes to changing spark plugs and cleaning. On the safety front there is an inertia activated chain brake that reduces the likelihood of injury due to kickback. 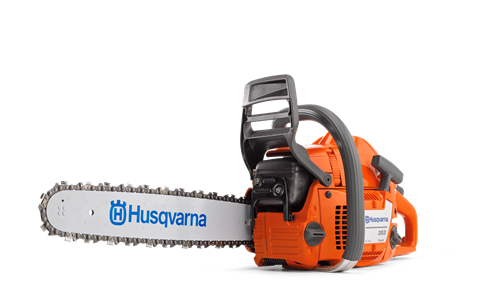 The 353 is just one in a whole range of premier and professional Husqvarna Chain Saws. Certainly not the most expensive, but has a host of enviable features and out performs many other more expensive competitors.